Working in an office where you feel happy, satisfied and motivated to work is like a dream for most of the people. There are people who got to live that dream, but conditions are not always that favorable for everyone. Many factors can play the role of villain in your work life which leaves you stressed, frustrated, demoralize, but one of the factors that really make the workplace living hell is a bad boss. A bad boss makes the working a living nightmare and in some cases, people leave a good paying dream job just because of the bad boss. Now the question is how to deal with a bad boss? 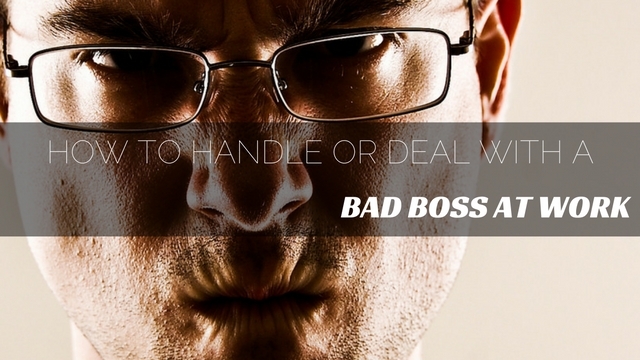 Signs of a Bad Boss – How to Identify? Sometimes it happens that the problem we are blaming others for, exists within us. If you are one of those people who blame others for all your problems, then there are chances that you are the villain of your own happiness, but because of your habit you are blaming your boss. If you still think that your boss is bad, then there are ways by which you can decide if your boss is really a bad guy or not. Here we are going to discuss how to identify the bad boss. 1. The first thing you should do is observe your boss and do it for a few days and check that if he/she really does something that directly or indirectly affects you in a negative way or you are just blaming for the things that are far out of his/her control. 2. Make a forgiveness scale for the mistakes you make and the mistakes your boss makes and compare that scale. Comparing the scale of forgiveness will give you the clear picture about how bias your scales are. If the results say that the things your boss does are really bad, then ‘yes’ your boss is bad. 3. Do not put blame on the boss for the decisions and policies that came from the higher authorities and out of reach of your boss. 4. Analyze the behavior of your boss and check how it is affecting you as well as analyze your activities that make your boss rude towards you. 5. Observe the behavior of your boss with other employees and if they too felt that your boss is seriously the bad one. 6. Try to find out the previous behavior of your boss before you join the workplace and if there is any problem that specifically causing your boss to be in a bad temper and if there is something that’s causing your boss to lash out on you. After doing this quick analysis, you will know that whether your boss is really the culprit or you are just blaming him/her for the things that are bad. If your boss really is the bad one, then the big question is how to deal with a bad boss. Dealing with a bad boss is really an exhausting activity that needs lots of strength and will power, but there is always a hope. Your boss is also a human who is working with more stress and pressure than you and there can be another reason that is causing the bad attitude towards you and other employees, so do not give up so easily. There are ways by which you can easily deal with your bad boss. The first step toward dealing with a bad boss is that you understand the attitude of your boss. Understanding of your boss’s attitude helps you in dealing with it and you prepare yourself for the outcome in a much better way than the surprise attack. It also helps in understanding the way your boss works and how he/she wants work to be done under his/her management. Actually we all have a particular way to handle the things and it may or may not be like the others, but when you know how your boss’s attitude towards the work then you understand from where this negativity is coming towards you. So understand your boss’s attitude to your best of ability, so that you can deal with it. It may look like one of the worst advice, but in reality, it really helps the case, especially if your boss is a workaholic and likes everything to be pristine and perfect. Many employees think as working against the bad boss is one of the best solutions as you not only get your revenge, but also make your boss look bad and incompetent in front of others, but in reality, it is one of the stupidest moves you make in your work life. Not supporting your boss is not so bright idea as it will affect your working relationship with each other as well as makes the working environment poisonous and not to forget your boss has more powers than you. So the best you can do is work with your boss so that you and your boss both can move forward and it also helps to tame the bad attitude towards you. When you face a difficult time working with your boss, ask yourself few questions like why you are working here and what are the good things about this job. These questions will help you in bringing positivity in your work life as well as motivate you to work harder. People often start to ignore their work and punctuality because their boss behaves in a bad way with them, but it is the childish move as it gives more reasons to your boss to put the blame on you. Never compromise with your work and be always on time as well as deliver work with punctuality so that your boss doesn’t have any reason to behave badly with you or berate you, as well as it will look good on your performance. You may feel good about yourself after berating and badmouthing your boss behind his/her back, but in reality, it only makes you the villain and if by any chance your boss is particularly bad with you then the situation becomes more damageable. Never utter nonsense about your boss with your fellow workers, colleagues or any other employee because not only you are spoiling the image of your boss but also jeopardizing your professional image you work hard for. So do not complain about your boss to your fellow workers because they may take benefit of the situation or you. Your work is what gives you name, fame, reputation and money so never compromise with your work just because you do not have the best boss in the world. There are people working in worst condition than you, still they work hard so that they can move ahead of that situation and make the best out of it. Actually, when you have a bad boss you start to lack in your work which ultimately makes your boss’s behavior worst towards you that ultimately makes you the faulty one. Always remember, your work is what will take you ahead and so work hard and give your best to your abilities so that your boss can never point a finger at you. Some people have nature of bullying those who works under them, especially those who show the reaction towards their behavior. The best way to deal with a bad boss is that never show him/her how their rudeness affects you because when you show the reaction they do it again to provoke you. Exercise some self-control and patience to deal with your boss, never answer back in a heated situation and so breathing exercise whenever you feel you are about to lose your self-control. Your self-control will keep you on the ground and you can deal with the boss in a more mature manner. Most of the people got intimidated by their boss because their boss holds more power than them and even in some cases bad boss bullies their workers or harass them mentally which leaves negative effect in their personal and professional life. If you are dealing with a bad boss, then never stand down just because the person you are standing against is your boss. Your boss may be the superior one, but you have right to complain against any harassment or take action against any mental or physical torture. Never fear your boss if you are the right one because your fear will fuel their arrogance and they may behave more rudely toward you. Do you change your work ethics just because you have a bad boss? Never do that, never compromise your values, morals, and work ethics just because your boss behaves in a wrong way with you. Your work is what brings you here not your boss and your work will lead you to a higher level, not your boss so why to compromise the thing that has the power to lift you from this place to something higher and nicer place. So do not let your morals go down because of your boss, also use it as a fuel to work harder so that you can work in better places with much better people. One of the best ways to deal with the bad boss is to maintain professionalism all the time. Never give space to your boss to berate you or put you down because you are not professional enough for the job. Your professional attitude will help you in the long run, especially when you choose to switch jobs or get the promotions. Always keep in mind that nothing is permanent, this is the phase which is going to pass very soon and easily if you do your best to stay away from the trouble. Behave in a way that is suitable for the job and do not show lack of professionalism just because your boss’s behavior is not so good towards you. Career decisions are one of those decisions that affect your personal and professional life in the long run and leave a long lasting effect on your work. Never make hasty decision just because you got to work with a bad boss, take it as a challenge, learn from your professional life and deal it with patience and cool mind. Keep in mind that no one is perfect and there can be the reason that prompts such behavior, try to understand the situation to the best of your ability and never make hasty decisions. If you are having a hard time dealing with your boss, then sit and think how you will behave when you are the boss and how you want your subordinates to work, that way you will better understand the situation. Dealing with a bad boss really is a tiresome job which drains you to the core, but giving up is not the option. If you feel you cannot tolerate anymore then file a complaint with the higher authorities, but first collect enough evidence so that you can put your case strongly. Dealing with a bad boss looks difficult, but with the right tactics, you can do it without compromising your work ethics. Never give up before you give it your best efforts because sometimes problem looks bigger than actually, it is in reality.